Baptiste Fournier — a one-star Michelin Chef in France and voted as one of the top 6 young chefs by the Gault Millau guide — is showcasing his creative touches in the kitchen of Mezze Bistro, from 29th October till 3rd November 2011. rif and I were invited to try his exclusive ala carte menu last Saturday with Ken of Foodpoi. 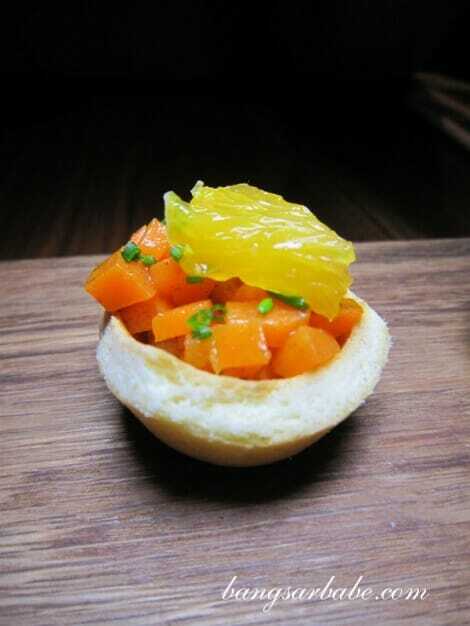 The food was paired with Sancerre wines from Fournier Winery, presented by the gregarious Sebastien Le Francois. We also had the privilege of meeting the president of Fournier Winery, Claude Fournier, who happens to be Baptiste’s uncle. We got there at 7pm, and managed to squeeze in a get-to-know the chef and wine maker session before customers came streaming in. 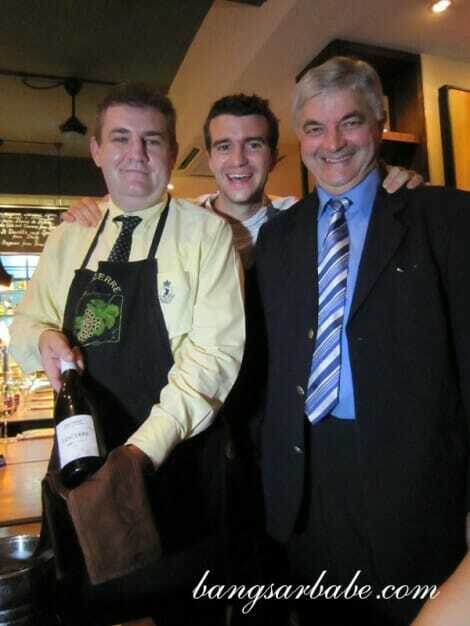 Claude was a soft spoken man who spoke passionately about his wines. Baptiste was as bubbly as he looked in the picture; he was quick to answer our questions regarding his dishes, and even hinted that we should order the vegetarian choice on the menu. 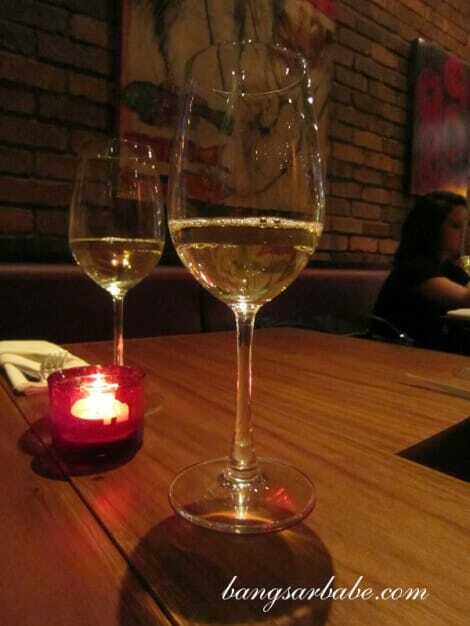 Sebastian served us the Paul Vattan Sancerre 2006, a Sauvignon Blanc. 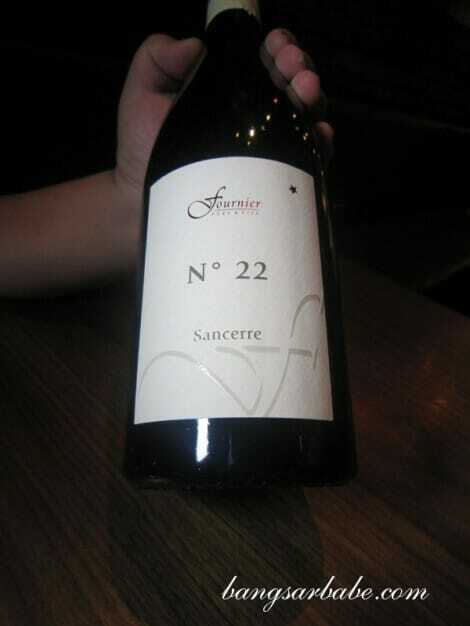 The thing about Sancerre wines is…there is no label indicating whether it’s a Pinot Noir or a Sauvignon Blanc. You have to look at the bottle to figure it out. 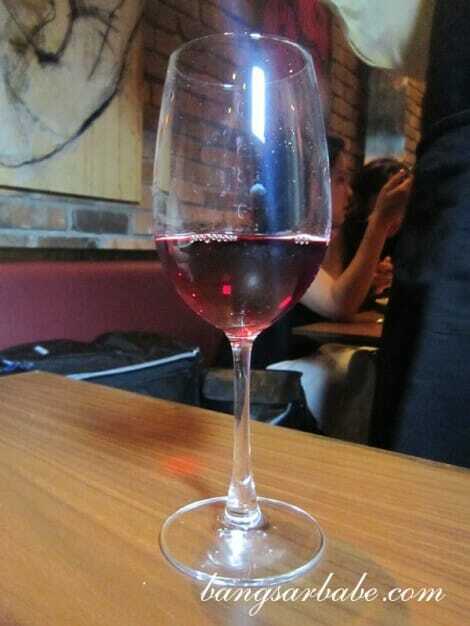 This was a lively wine — full and fresh with a hint of lemon, mineral and floral notes. 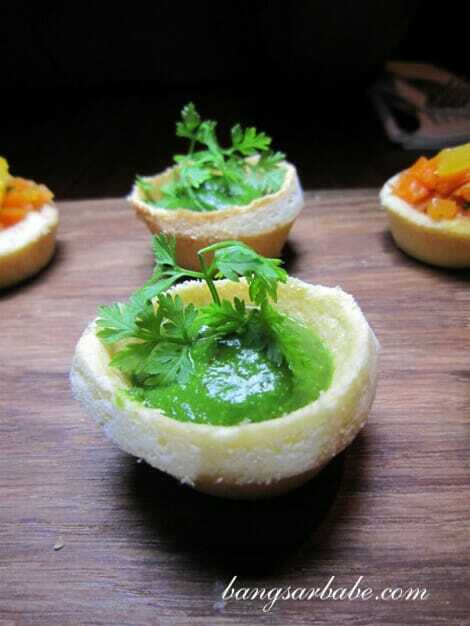 Prior to our entrees, we had two surprise treats from Chef Baptiste — spinach puree and diced carrots in mini pastry crusts, and green pea soup with grape fruit sorbet and grape fruit pieces. 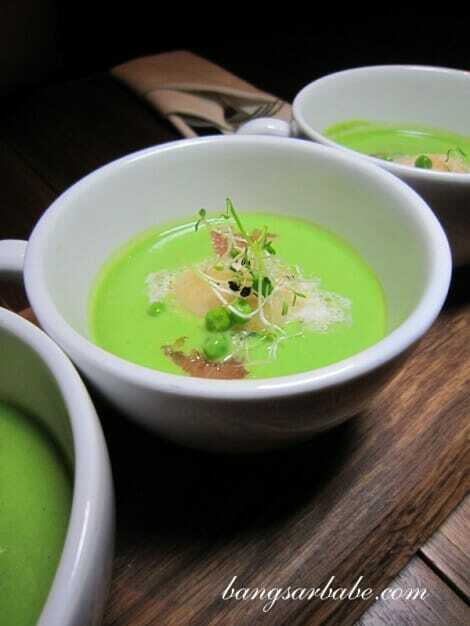 The latter, served cold, was an interesting take on green pea soup. I thought the tart flavour of the sorbet and fruit livened up the overall flavour of the soup. Since there were three of us, we picked all three entrees to share. The Terrine of Chavignol Fromage with Flame Raisins et Sauvignon Cream (RM38++) was a decadent composition of goat cheese and raisins. Smooth, rich and creamy without being overly cloying. I have to thank Ken for kindly lending me his flash light and giving me tips on how to take better pictures. Otherwise, my pictures wouldn’t be this nice. So nice of him right? 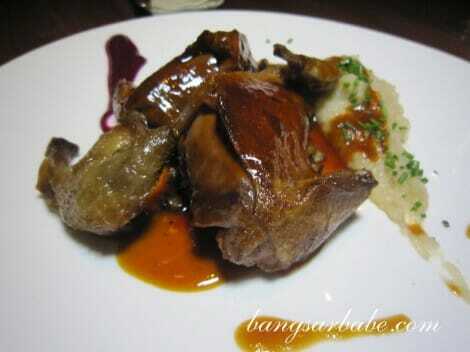 My favorite of the three entrees was the Fondant of Escargots et Pork Trotter in Vegetable Jus (RM33++). The fondant had caramelized edges and a good balance of diced pork trotter and escargot. 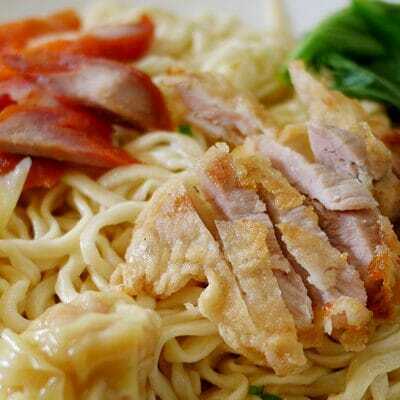 I know I’m going to sound very “jeng”…but this entree was oh-mai-god so yummy! 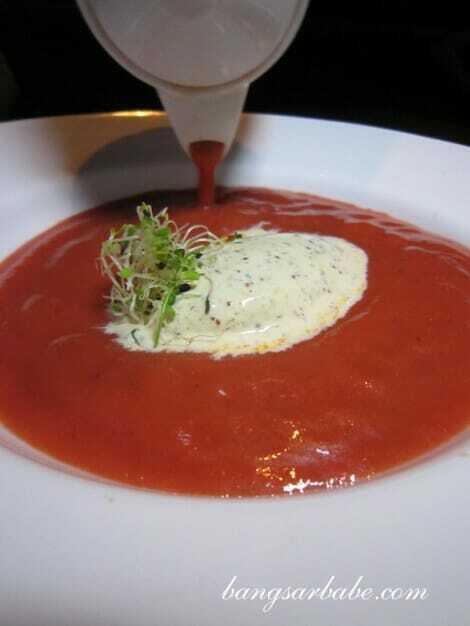 Since the two boys didn’t fancy tomato soups, they had a few spoons of the Baptiste’s Signature Mustard Ice Cream with Cool Tomato Gazpacho (RM28++) before surrendering the balance to me. The ice cream comprised cream and whole grain mustard. 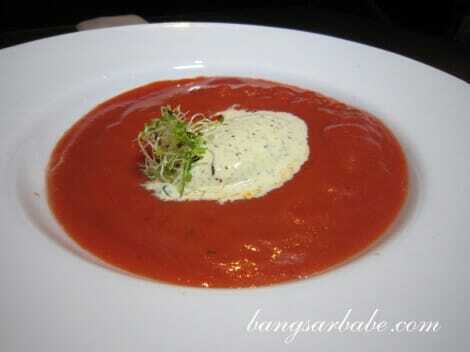 The tomato gazpacho was poured over the ice cream and mixed together for a full flavoured experience. One pigeon devoured, 24 more to go! “We only have 35 French pigeons for this special ala carte menu”, said Chef Baptiste, who storied us on how our customs took away 10 pigeons during their interrogation inspection. 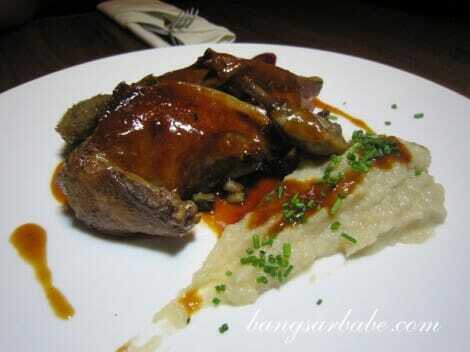 So with us having the Roasted French Pigeon with Baby Root Vegetables Puree (RM92++), Mezze only has 24 pigeons left. Don’t miss out! The bird was sous vide for 30 minutes at 65 degrees celsius, and roasted till the skin is crisp and mahogany brown. It was delicious — the pigeon was pink and tender all over. I am easily influenced by books and movies, and recalled a movie scene where Julia Child talked about her lovely lunch of fish when she first arrived in Paris. 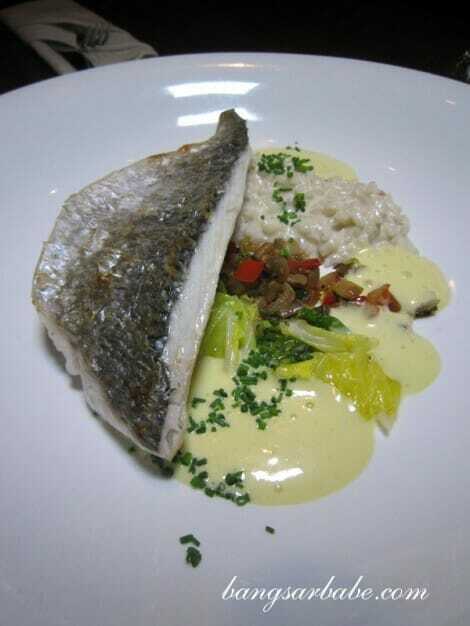 So I suggested that we try the Air Flown Fresh French Sea Bream with Basil- infused Risotto in Buttered White Sauce Reduction (RM90++). We all loved this. The fish was fresh (despite coming all the way from France) with large flakes and went beautifully with the buttered white sauce reduction. 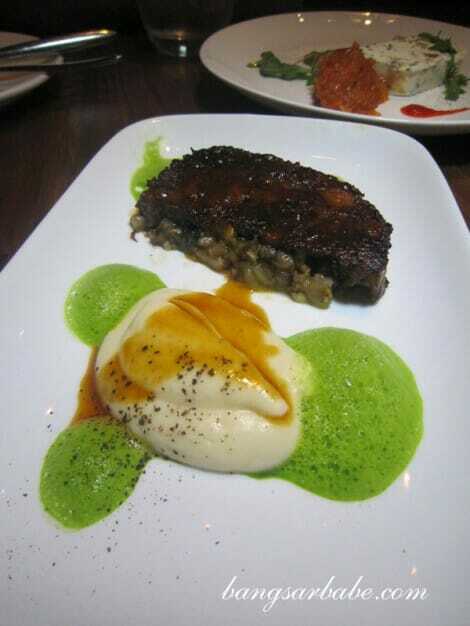 I also enjoyed the risotto; firm and aromatic from the basil and cream. 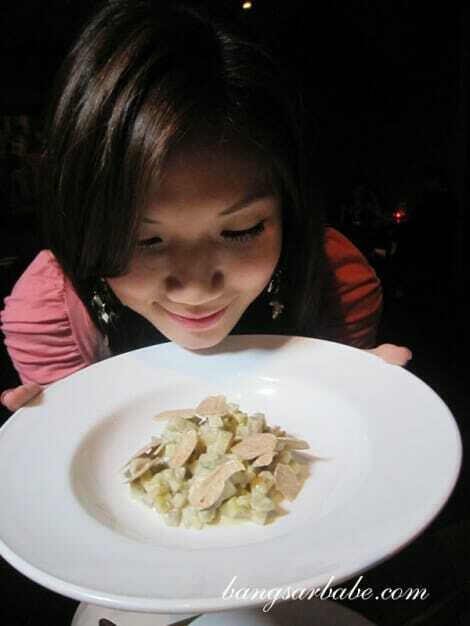 “Did you know that Chef Baptiste hand carried the white truffles to Kuala Lumpur?” said Ling, prior to our dinner. Baptiste hinted that if we were to order the vegetarian choice, we would be getting quite a bit of white truffles. He wasn’t kidding. This was so simple, but so good. The diced vegetables were sauteed with cream and minced black truffles, and topped with generous shavings of white truffles. 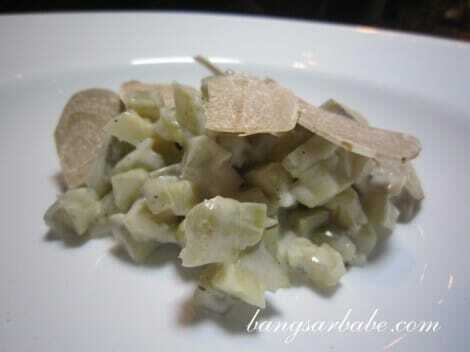 White truffle + black truffle = heaven on a plate. Très délicieux! Desserts were the Panna Cotta with Sorbet of Mango and Exotic Seasonal Fruits (RM22++), Crispy and Intense Dark Valrhona Chocolate with Banana Coulis (RM25++) and Baptiste’s Fine Apple Tarte with Caramel Vanilla Bean Ice Cream (RM24++). True to his reputation, Chef Baptiste’s desserts looked beautiful. The panna cotta was almost too beautiful to eat, and it tasted amazing. 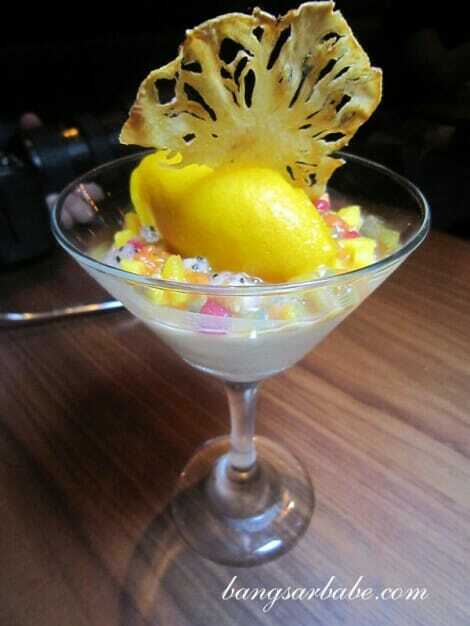 The addition of mango sorbet and diced seasonal fruits flattered the panna cotta, which boasted an almost silky finish. 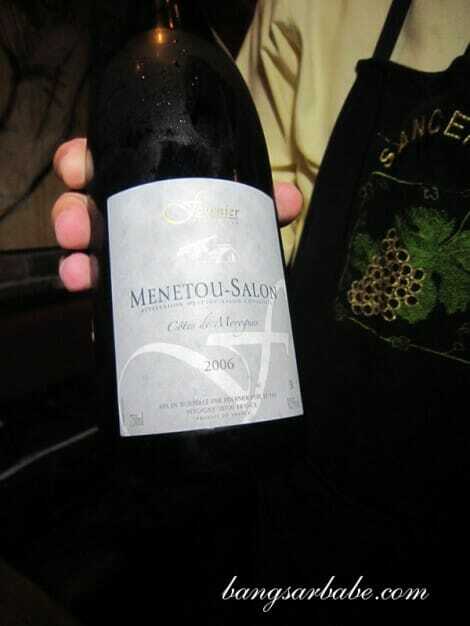 The Fournier’s Menetou-Salon 2006 was light on the palate, but the dark Valrhona chocolate changed the taste — it became fuller and bolder. 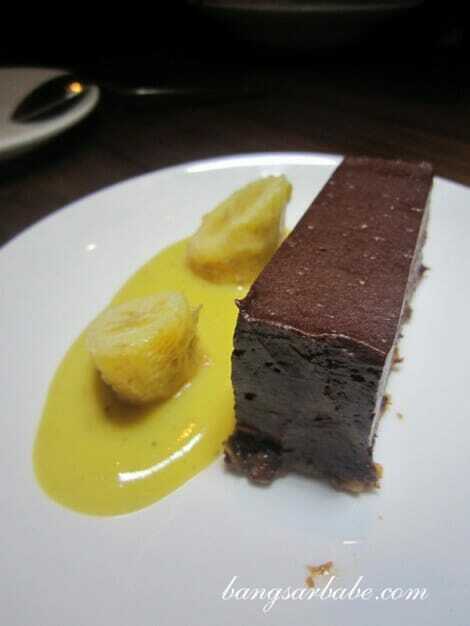 I thought the banana coulis added a playful touch to the rich chocolate dessert. Trust a French to make a good apple tart. But when it’s a Michelin star chef, you get a really good apple tart. 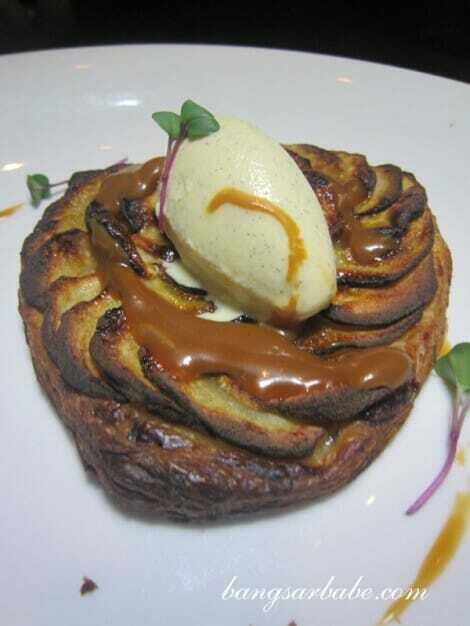 Baptiste’s apple tart was flaky and light with a generous drizzle of dulce de leche. The ice cream was fragrant and dotted with spots of vanilla beans. Dinner was lovely and portions were fair, if not, generous. It also helped that my company was great. Thank you Ling, for the invite. rif and I had wonderful time! 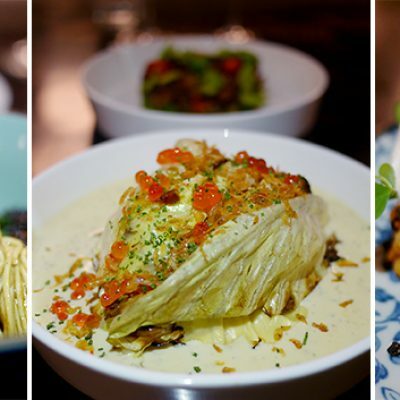 If you’re interested in trying Chef Baptiste Fournier’s exclusive ala carte menu at Mezze Bistro, you have until 3rd November 2011 to do so. 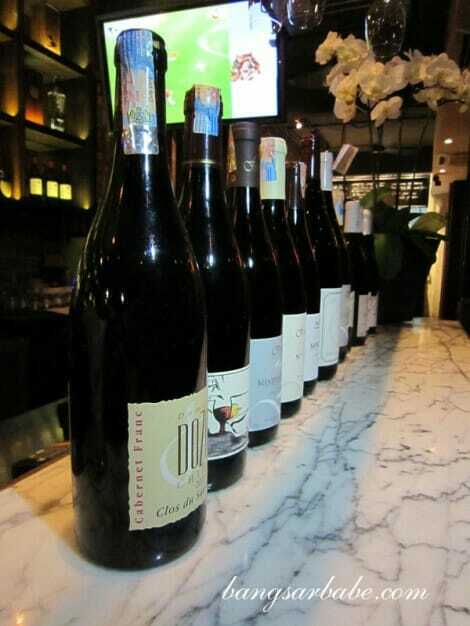 Mezze is hosting special food and wine dinner on Wednesday (2nd November 2011) at 8pm, priced at RM350nett per person with wines and RM280nett per person without wines. For reservations, email [email protected] or call Mezze Bistro at 03-2095 0122. Verdict: Pigeon, white truffles, pork trotter…you have to try them all!